Are you dreaming of purchasing a home of your own, but feel it will never happen? One home buying tip is to create a down payment savings account and make it an automatic withdrawl from each and every paycheck! 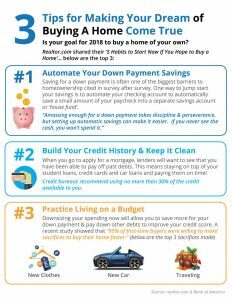 Click here to check out this infograph for some more helpful tips to make your dream come true!!! Call me for more home buying advice and lets get you on your way to living your American Dream!